The word “sarcophagus,” from the Greek sarkophagos, “flesh-eater,” refers to a stone coffin that devoured its occupant. (Such a coffin was presumably made of limestone, because of the material’s corrosive action on flesh.) 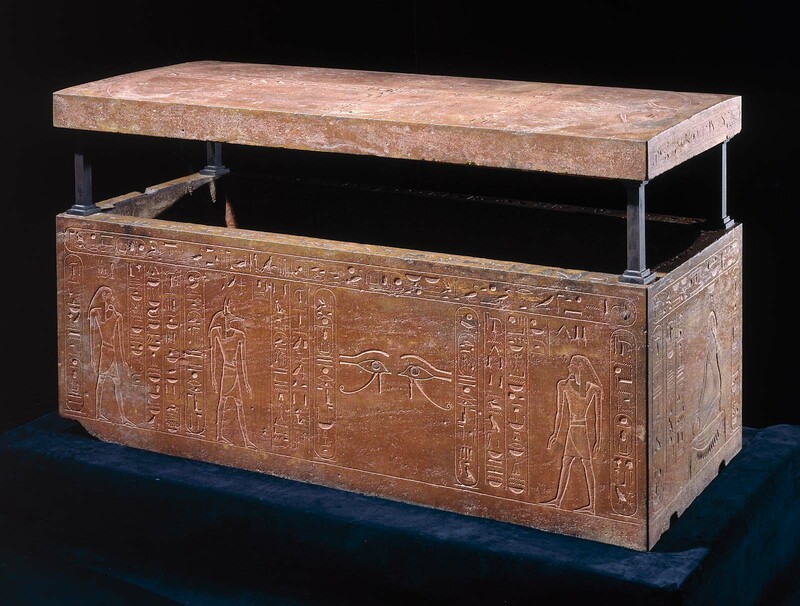 Although the very notion of a container that would devour the body inside it would have horrified the ancient Egyptians, we use the term “sarcophagus” today to refer to coffins of stone as opposed to wood. The Egyptians used a happier name, “lord of life,” because it was meant to protect and preserve the body forever. The kings of Dynasty 18 were buried in magnificent hard stone sarcophagi of quartzite or red granite. Because of their ruddy hues, these stones were associated with the sun, ultimate symbol of rebirth, and were thus particularly well suited for the rulers’ journey to the next world. 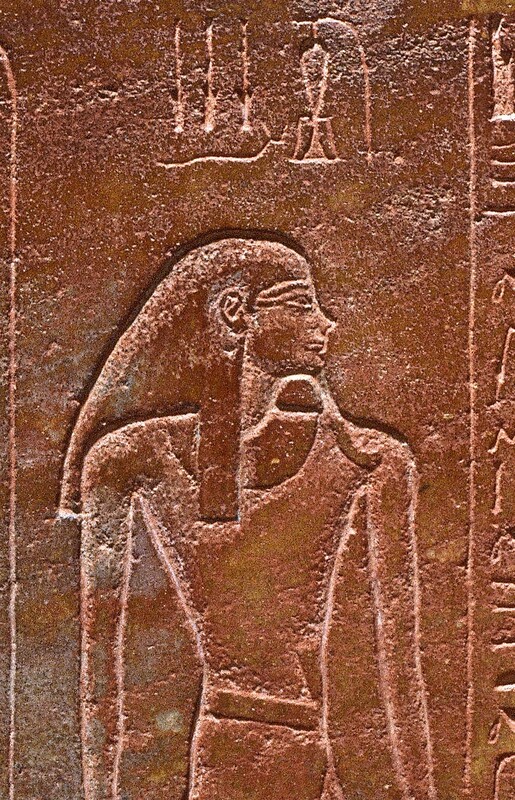 To intensify the color, a coat of red paint was often applied to the surface of the stone, filling in the hieroglyphs and outlines of the figures. 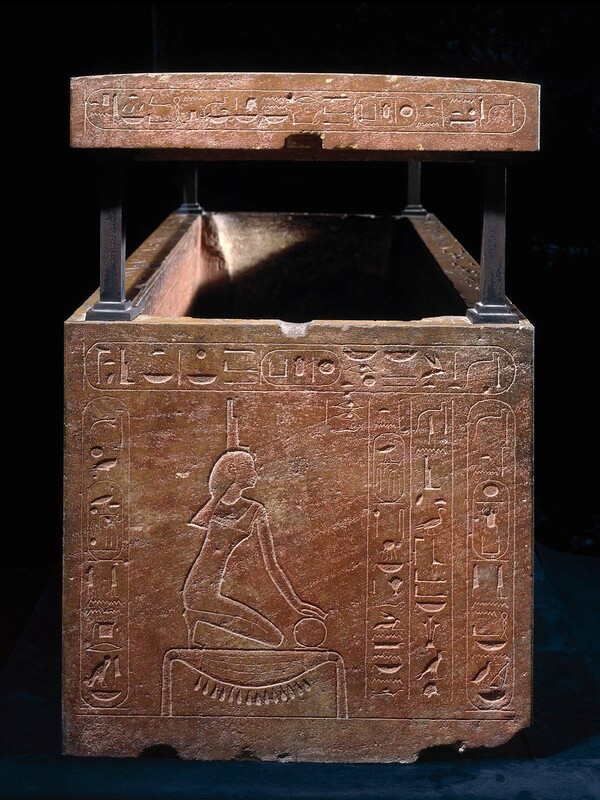 This Eighteenth-Dynasty royal sarcophagus is the only one outside of Egypt. 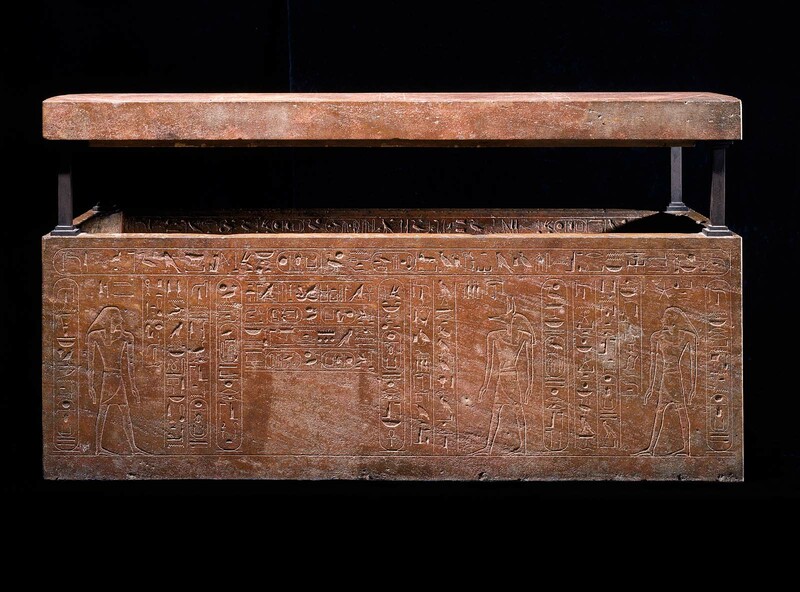 It was the second of three quartzite sarcophagi made for the queen turned pharaoh, Hatshepsut. 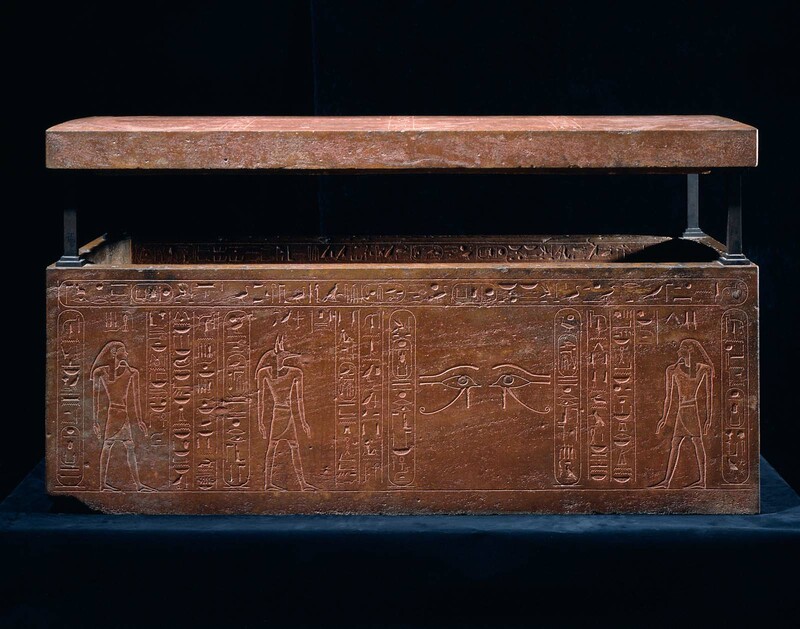 After she assumed control of the throne, she commissioned a tomb in the Valley of the Kings and ordered this sarcophagus to be made for it. Later, however, Hatshepsut decided to transfer her father’s mummy from his tomb to hers, and ordered her coffin to be retrofitted for him. 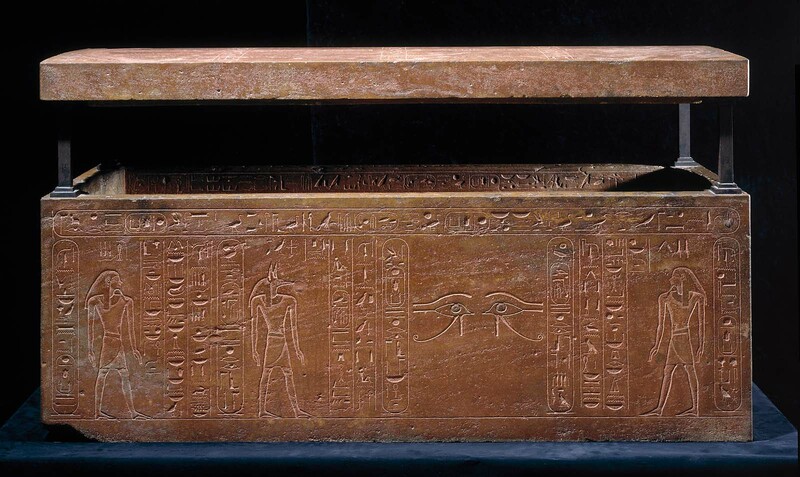 The original inscriptions were altered to reflect the new recipient, Thutmose I. His name was substituted for hers, feminine pronouns changed to masculine, and new inscriptions added. 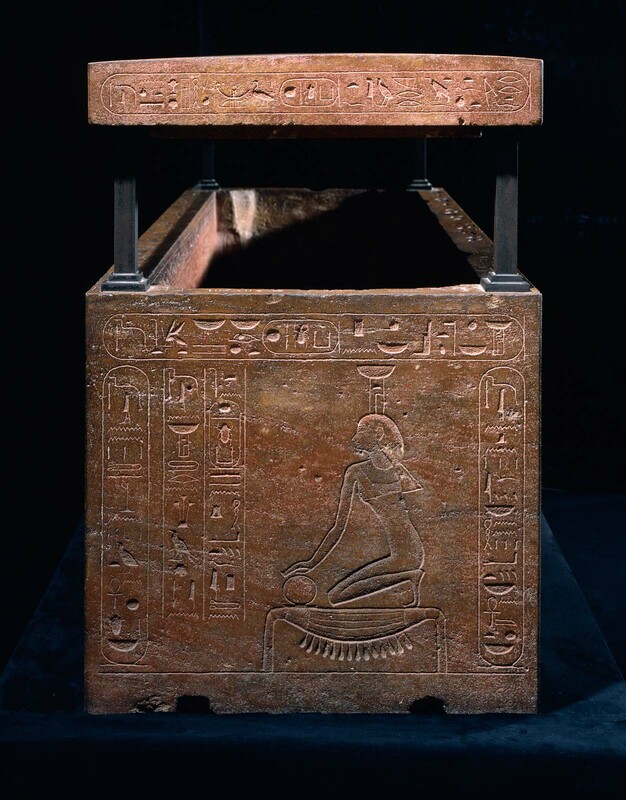 This pious act of filial devotion is commemorated in an inscription on the outer right side of the sarcophagus: “She [Hatshepsut] made it as her monument for her beloved father, the good god, lord of the Two Lands, king of Upper and Lower Egypt Aakheperkara, the son of Re, Thutmose, vindicated.” At the last minute, it was discovered that the sarcophagus was too small for Thutmose I’s mummy, still in its original wooden coffin. Therefore, the insides of the box had to be cut back to receive it. From Thebes, Valley of the Kings, tomb KV 20. 1903-4: discovered by Howard Carter of the Egyptian Antiquities Service for Theodore M. Davis, Theodore M. Davis excavations in the Valley of the Kings. 1904: assigned to Theodore M. Davis in the division of finds by the Egyptian government; 1904: given to the MFA by Theodore M. Davis.